Have you ever hit a hole-in-one before? No, got to about 8” that’s it, and for the 2nd, Yes 28 days earlier!! Give us a brief description of your magic shots? 02/05/15 Not the best of shots off the tee, you need to carry about 155 yards over the bunker surrounding the front of the green, started low and got a bit higher, just clearing the bunker edge, little puff of sand (must have took the pace off it) then a gentle roll bearing right and……….plop!! In she went WOW… A fellow player Julian, coming down the 12th yelped out louder than I did. 30/05/15 We started on the 1st, not playing bad, get to the 4th, an elevated tee box pushed right up in the corner for the Medal. As I struck it the ball flight was lovely and high with a little draw, it landed on the green 2 yards in front, one little hop and it trickled up to the pin. Wow, that’s close I thought as I could still see the ball. Yelps from the 5th tee players raised my hopes, then the wind moved the flag stick and then, oh my, it dropped. What were your feelings when the ball disappeared into the hole each time? 02/05/15 I was shaking with delight as I stepped up to the pin to see it at the bottom, oh my, what have I just done. It was on Twitter (not by me) before I got back to the club house. 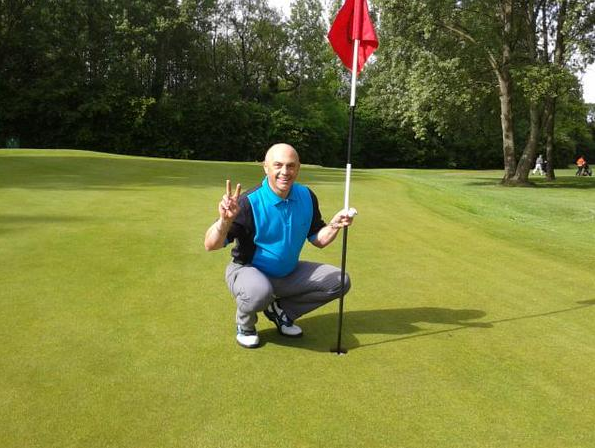 The thing is, we tee’d off on the 10th 1st, the hole in one was on the 13th and my game went to pot afterwards! 30/05/15 Sheer disbelief, how am I going to get away with this again, 2 in a month? What will the wife say?! What will Golf care say?! Any other interesting bits of info of the two days? On the 30/05/15 It was my 49th Birthday and before I left home, I opened my cards. One was from my wife’s Aunty Pauline, inside it said “Happy birthday Paul, Hope it’s a good one with another hole in one” We have asked her for the lottery numbers! I would just like to say that at the back end of 2014, I seriously contemplated giving golf up, I never had enough time to practice or play and my handicap was 26. “Sort it out or sell up I said”. So In March I contacted Alistair Davies at the Forest of Arden, had some lessons, purchased all new Ping G30’s and started taking it more serious after playing for 15 years. 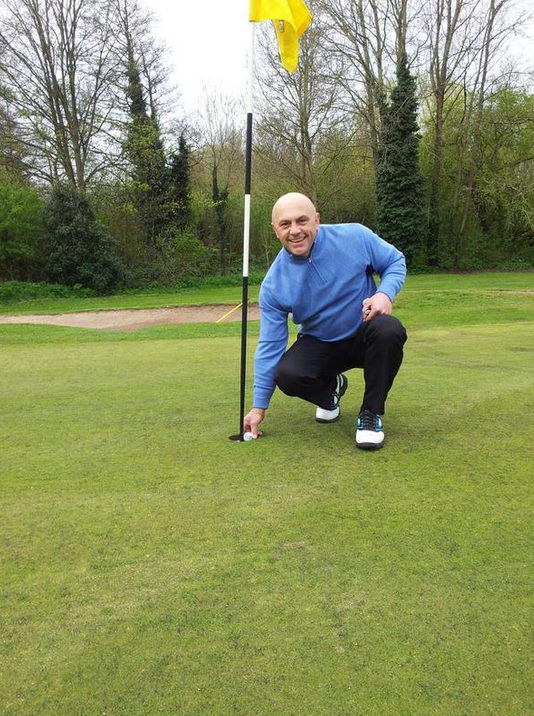 At the end of March, I was still off 26, had some great results in club competitions after the lessons and new clubs and my handicap came down to 16.9 (17) in just over 5 weeks, so the two holes in one topped off a whirlwind period. Every year I take out the insurance, my wife says “is it really worth it” I tell her that you never know when you will need it (honestly believing it would be a wayward shot that causes some damage, not the hole in one part)! Now you’re the best thing since sliced bread in her eyes!! One thing that I am cheesed off about is the fact that my club uses the IntelligentGolf scoring system, we used to have Howdidido. So because of that, I dipped out on 2 Hugo Boss watches. Ping very kindly sent me engraved glass trophies for each occasion, and Titleist gave me a Hole in one bag tag, certificate and a sleeve of ProV’s. So felt like a pro!! I was featured in the Midlands Golfer magazine (issue 26) and was their achiever of the month. Within that, I mentioned that I was covered by Golf Care and that is was the best insurance I’ve ever had. Congratulations Paul on a truly phenomenal effort! We wonder what you’ve got in store for your 50th next year? !